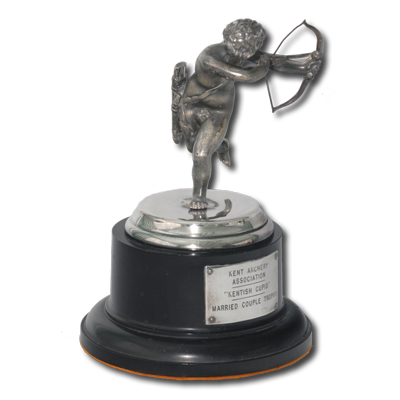 Cast Cupid model, mounted on wooden base. Kent Target Championship & Open Tournament. Kent married couple, both shooting recurve, with the highest combined score. 31 Aug 2013: Retired as part of the on-going review and simplification of awards. 31 Aug 2013: While originally envisaged as encouraging family participation, there are now significant legal and cultural issues with the award criteria. It has become commonplace in recent years, that nobody or only one couple fulfil the award criteria, so there is no effective competition for the award. Open only to members of the Kent Archery Association. senior gentlemen shooting the York round with the recurve bow. Couples do not require nomination or entry for the award in advance.